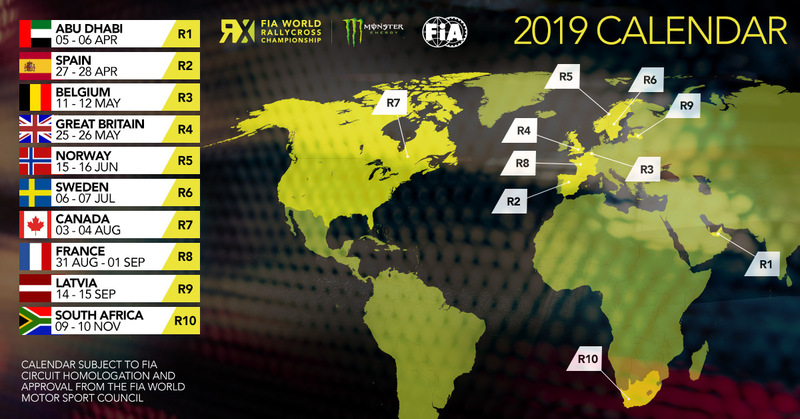 Saint Petersburg, Russia – Following an FIA World Motor Sport Council meeting in Saint Petersburg on 5 December, World Rallycross Championship managing director Paul Bellamy announced a revised 2019 WRX calendar, which has effectively been reduced from 12 to 10 rounds. As early as 25 October we were told that the Portuguese round at Montalegre, Vila Real, had been dropped, to be replaced by a new season-opening ‘away fixture’ at Yas Marina in Abu Dhabi, while the German round at Estering would become a European championship-only standalone event. The 11-round season would end with the World Rallycross of Cape Town at Killarney International Raceway on 30 November and 1 December, to accommodate the Killarney Motor Show on the first Sunday in November and the Toy Run on Sunday 24 November. Now, however, the United States round at the Circuit of the Americas in Austin, Texas on September 28 and 29 has been downgraded to a round of the American Rallycross series, “which World Rallycross teams will be welcome to compete in, but it will not be part of the World Championship”, said Bellamy. The World Rallycross of Cape Town at Killarney International Raceway has also been moved forward to the weekend of 9/10 November. This has had a knock-on effect, forcing the Western Province Motor Club to move its premier Killarney Motor Show up to 27 October, just two weeks before the World Rallycross event. On the upside, however, it has become possible to include an additional, ninth round of the Regional Power Series sponsored by Wingfield Motors on 30 November, to provide an even more action-packed year for Western Cape motorsport fans.